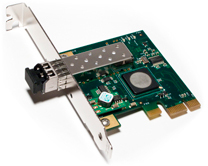 The Adnaco-H1 is a host adapter for our PCI Express over-fiber-optic solution, the Adnaco-Sirius™. The H1 provides an interface between a host computer PCIe bus and a duplex multi-mode fiber optic cable. The fiber optic cable connects the H1 to remote PCI/PCIe devices. The Adnaco-H1 is a standard, low-profile PCIe host adapter card with standard fiber optic SFP transceiver. It provides an interface between a host computer PCIe bus and a duplex multi-mode fiber optic cable with LC connectors. The fiber optic cable connects the H1 to remote PCI/PCIe devices at distances up to 250 meters. The H1 can be installed in any PCIe slot and supports one full duplex 2.5 Gbps link. This link is transparent to software applications and drivers, so industry-standard desktop computers and servers can communicate to remote PCI/PCIe devices with no additional programming.